Contact with the helicopter, which has four crew members on board, was lost at 1am this morning. A MAJOR SEA search is underway off the coast of Co Mayo for three missing crew members of Coast Guard helicopter Rescue 116. Its pilot, Captain Dara Fitzpatrick, was pronounced dead this afternoon. She was pulled from the water in critical condition at first light this morning. A search is continuing six miles west of Blacksod for the remaining crew. 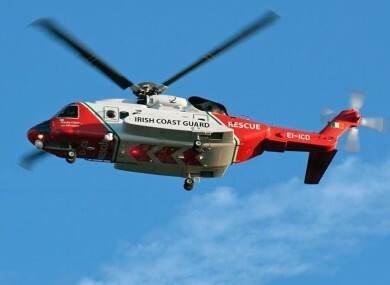 At a briefing at the Department of Transport, Tourism and Sport this morning, Coast Guard Director Eugene Clonan told reporters the Dublin-based crew had been tasked to assist the Sligo-based helicopter R118 in a medical evacuation from a UK registered fishing vessel. One of the members of the crew on board the shipping vessel, some 150 miles west of Eagle Island in Mayo, had been injured and required on shore medical attention. Clonan said it is standard procedure during a long-range rescue to have two helicopters at the scene – one to do the pick-up and the other, referred to as the ‘chase helicopter’ to provide “top cover” - essentially acting as a backup in case something goes wrong. Rescue 116 was on its way from Dublin to Blacksod to refuel before joining the Sligo-based helicopter at the fishing vessel’s location. The last message from the crew said they would be arriving shortly at Blacksod. Contact was lost just before 1am this morning. Clonan said there was concern when the helicopter disappeared from the tracking screen. A major search was launched and one person was taken from the water shortly before daybreak. “It’s a very dark day for the Coast Guard and search and rescue service. At this particular time our thoughts and prayers are with the families from the helicopter that was lost off the Mayo coast,” Clonan said. He said there is a “wide debris field” at the scene and search and rescue workers are continuing to search the area. Helicopters from Sligo and Shannon are on scene along with the Air Corps Casa. Ballyglass and Achill lifeboats are on scene along with five local fishing vessels and the Naval Service’s LÉ Rósín. Tony McNamara, lifeboat operations manager in Achill told TheJournal.ie their boat was on scene at 2.15am. McNamara said “quite a bit of debris” could be seen in the water at the scene early this morning. Jurgen Whyte, Chief Aeronautical Officer at the Air Accident Investigation Unit (AAIU) said investigators will be searching for the two flight recorders in the wreckage. One recorder contains all communications information and voice recordings. The second provides details of engine power, speed and heights. He said recovering this data should provide “some sort of lead as to what way the investigation should progress”. The search operation is being coordinated by the Coast Guard’s Malin Head control centre. Minister for Transport, Tourism and Sport, Shane Ross, expressed “deep concern” at the news. As the search for the Dublin based helicopter R116 is currently underway I would like to express my sincere support and sympathies for all those involved, particularly those family members who are awaiting news of their loved ones. This is an extremely difficult time for all concerned. Email “Search continues for three members of Coast Guard helicopter crew ”. Feedback on “Search continues for three members of Coast Guard helicopter crew ”.